Easton is a casual, traditional medical ID bracelet that’s lightweight, comfortable to wear, and made with high quality materials. Ideal for those with metal sensitivities, Easton is nickel-free, hypoallergenic, and waterproof. This custom-engravable medical ID bears a traditional red caduceus on the front to alert first responders to your medical information, engraved on the back. 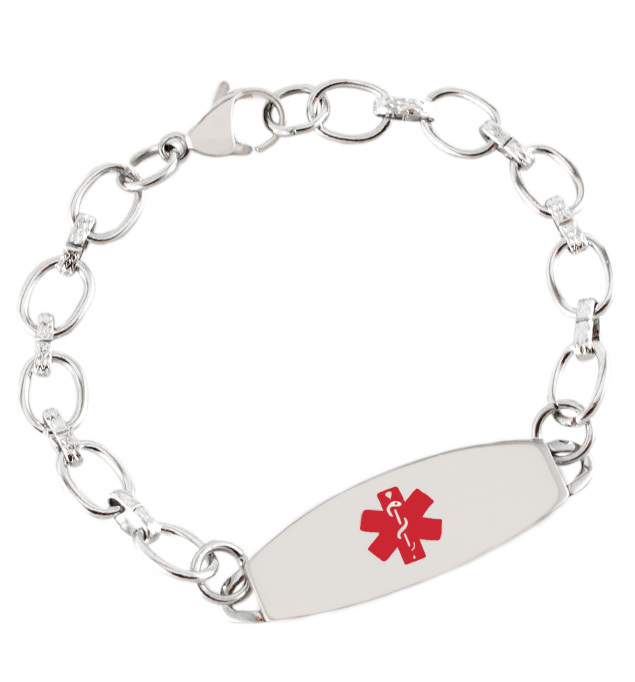 Wearing nickel-free, hypoallergenic medical ID bracelets is extremely important for people with metal sensitivities and nickel allergies. This waterproof med ID is a great choice whether you wear your medical alert bracelet for food allergies, heart conditions, lymphedema, autoimmune diseases, pacemaker use or other MRI limitations, or any other medical condition or treatment consideration. Custom engraving allows you to choose the look you want so you can stay safe in style.